The Lake Kutubu Rainbowfish was scientifically described by Munro in 1964. Its scientific name is Melanotaenia lacustris. The species was collected by Patrol Officer T. Terrell in 1955. It would then take until 1983 before the species was collected again, this time by Gerald R. Allen, Barry Crockford and John Paska. The Lake Kutubu Rainbowfish can reach a length of at least 12 cm (4.7 inches). The body colourations varies from brilliant turquoise blue to more greenish shades on the upper half of the body, while the lower half is white. The back can sometimes have a golden shine. The Lake Kutubu Rainbowfish lives in central Papua New Guinea. It has only been found in Lake Kutubu and the connected Soro River. Lake Kutubu is the second-largest lake in Papua New Guinea and situated in the Southern Highlands. (It drains into the Kikori River.) Unlike most other lakes in the country, Lake Kutubu has formed in a depression in the rugged interior mountains. This mountainous region is located at an elevation of 800 meters (328 feet). The water in the Lake Kutubu Rainbowfish habitat is clear and the lake gets majority of its water from underground sources. The surrounding environment consists of limestone and the water in the lake is really alkaline with a pH-value of 8.5-9.0. The lake has a rich underwater plant life. About every second year, a massive upwelling of really dark water from the bottom of the lake occurs, a phenomenon known as “the turning of the water”. This water is oxygen-deficient and causes massive fish death during a few days. The Lake Kutubu Rainbowfish is listed as “Vulnerable” on the IUCN Red List of Threatened Species. The chief threats against the species are the introduction of gill nets and outboard motors on the lake, combined with the development of oil drilling and logging in the area. Papua New Guinea's first commercial oilfield development, the Kutubu Oil Project, is located in the region and began production in 1992. The creation of new jobs has caused the population to increase, which has led to problems with overfishing, forest destruction and pollution. In addition to the Lake Kutubu Rainbowfish, Lake Kutubu is home to 11 other endemic fish species, such as the Kutubu tandan (Oloplotosus torobo) and the Kutubu hardyhead (Craterocephalus lacustris). Together with Lake Sentani, Lake Kutubu forms an ecoregion on the WWF's Global 200. The Lake Kutubu area has also been designated a "Wetland of International Significance" by the Ramsar Convention. The Lake Kutubu Rainbowfish is a peaceful species that can be kept in a species aquarium or be combined with other non-aggressive species of similar size. Fulfilling its requirements in the aquarium is not difficult. Try to mimic the natural habitat of the Lake Kutubu Rainbowfish when you set up the aquarium and include both plants and rocks. Hiding spots are important. The recommended water temperature is 21-25 degrees C (70-77 degrees F). The water should be alkaline, from pH 7.1 to 9.0. 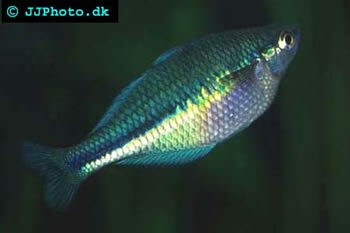 In its natural environment, the Lake Kutubu Rainbowfish is used to a pH-value of 8.5-9.0. 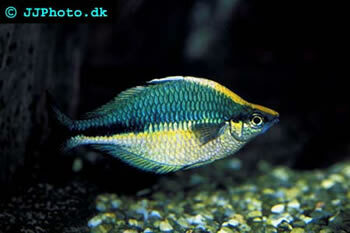 Provide your Lake Kutubu Rainbowfish with a varied and nutritious diet. It might very well survive on dry food only, but combining dry food with live meaty foods is strongly recommended. You can for instance cultivate your own brine shrimps and insect larvae. If you want to breed Lake Kutubu Rainbowfish you must provide them with suitable spawning media, e.g. densely grown java moss or man-made spawning mops. Adult fish might eat eggs and fry and it is therefore safest to move the spawning medium with the fertilized eggs to a separate rearing container as soon as possible after spawning. If you keep the water temperature in the upper part of the recommended range you can expect the eggs to hatch after 10-12 days. Newly hatched fry can eat infusoria and finely powdered flake food. When they have grown a bit bigger, you can start giving them newly hatched brine shrimp and whole flakes. A fairly slow growth rate is perfectly normal, even for fry kept in ideal conditions.